@ Tiffany Thank you! 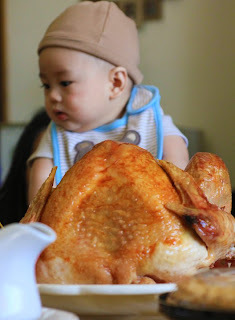 THIS year our Baby is BIGGER than the Bird! LOL. Have a wonderful Thanksgiving and THANK YOU for stopping by! @ Rachel Joy Back then no. This year? I'd say he could eat about 1/2! LOL. He's a great eater! Happy Thanksgiving to you :) Thank you for visiting!